Description: Construct a seat of government now in order to found a new village soon. In case you are not sure if you want this village to remain your capital village, please select the residence. Task: Construct a residence or palace. How to do this task: Go to your inner village, click on the empty green spot. Go to Infrastructe tab. 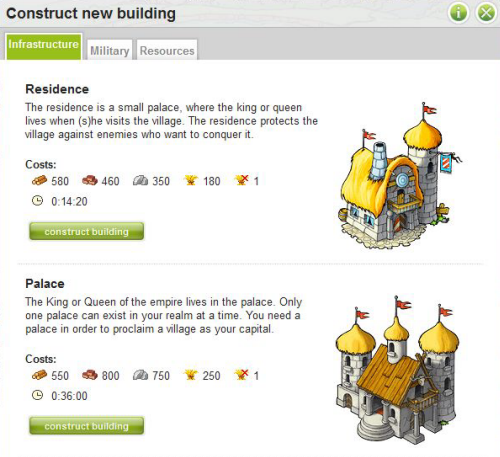 There you can choose between residence or palace, if you have enough resources. There are slight differences between these buildings, so choose wisely. Find out more about residence or palace. Text upon completion: This building is necessary in order to settle a new village or conquer one. Its level limits the amount of possible expansions.